Home Our Garage Door Services Garage Door Springs Why Do Garage Door Springs Break? It is not uncommon to see garage door springs break over time even though regular maintenance should increase their longevity. Here are some common reasons why garage door springs snap. Torsion springs play a vital role in door operation and they will certainly wear out over time. It all depends on the usage and the cycle rating of the spring. Considering the fact that a garage door opens and closes 3-5 times a day on an average, it is built to last around 10,000 cycles of operation. This also depends on the size of the family as many members tend to use the garage door far more often. This may result in a shorter life span.Why do garage door springs break? Garage door springs are in a state of constant tension all the time and freezing temperatures cause them to wear and tear. Rust is another common cause for broken springs as it increases friction in the coils. Further, rust in itself is corrosive and damages springs easily especially in locations that are predominately wet. It's advisable to use a mild silicone spray on the torsion springs every 3-4 months as this is an effective preventive maintenance technique. However, you should never use a WD-40 as it tends to attract dirt on the spring. There are few easy ways to test if the garage door springs are working fine or may break any time soon. 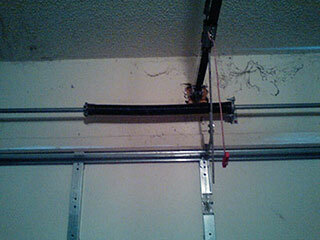 Test the balance of the garage door by using the emergency release cord. If the door makes any noise while raising or lowering, then the hinges need to be lubricated. You can also test the spring by bringing the door all the way down, raising it to about 4 feet above the ground and releasing. If the door sags, then it's time to replace springs. Having serviced the local area for over a decade, our professional team is always at your service when it comes to garage doors. Browse our website to learn more about our company and services, and see what our previous customers had to say about us in our testimonials! Thank you for choosing Garage Door Repair Naperville! One of our experts will be in touch soon. Feel free to browse our website for FAQ, tips and more useful information in the meantime!